Sweets are an integral part of Indian culture. Festivals, weddings and other auspicious occasions are incomplete without sweets. Thanks to my Indian roots I have a strong sweet tooth. As far as I know, my sister is the only other person who is worse than i am in this regard. The other day when I was home alone, I had a sugar craving that needed instant gratification. So i decided to make ari unda a.k.a rice laddus, which used to be one of the tea time snacks I used to have as a kid. Though I love the taste of ari unda, I am not sure if its taste will suit every palate. 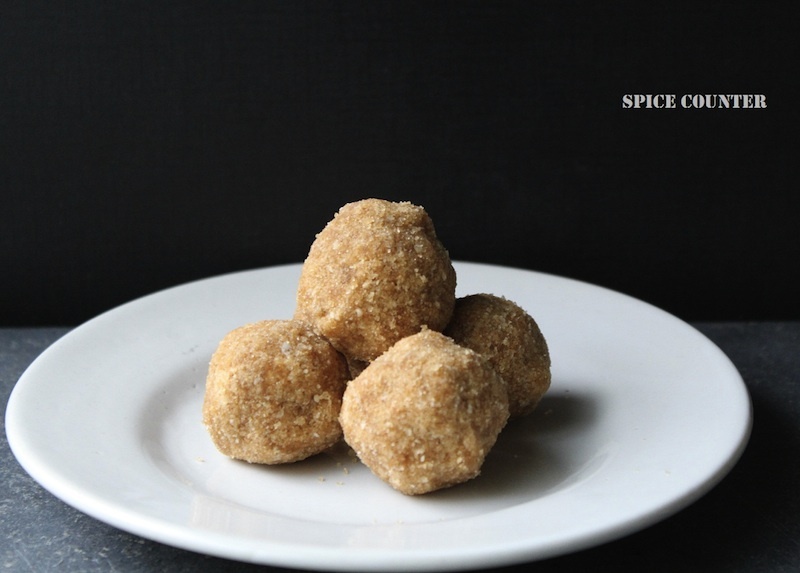 Ari Unda, a sweet with its origins in Kerala, is made from rice, jaggery and coconut. Ari Unda/Rice Laddus should be ideally consumed in a day or so since it uses fresh coconut and also because it gets dry over time. Alternately, you can roast and grind the rice and store it in air tight containers and make the rice laddus in small quantities as and when required. Wash the rice multiple times till the water comes out clear. Drain the water and dry roast the rice till it pops up and is golden brown in colour. Cool the rice and then powder it in a mixer till it is fine. Now add the jaggery and coconut to the mixer and grind for a minute or so till the rice powder, jaggery and coconut have blended well. Divide the mixture into small portions and shape them in the form of laddus/balls. I've passed a Leibster Blog Award to you…have u seen? Hi, ive seen it. Thanks for the award. Havent posted about it since its difficult to find 11 deserving bloggers.